Consider how you’d speak to visitors walking into your store if you were doing business in the pre-internet age. What would your face-to-face delivery sound like? What kind of language would you use? Your About Us page should read like the beginnings of that friendly conversation. What this means is that you’ll probably want to speak in the first person (“I,” “we,” “us”) to your visitor (“you,” “your”). There are some About Us pages that manage to sound good while using a third-person objective voice, but for the most part these attempts come across as distant or insincere. You’re going for intimacy, affability—maybe even a little humor, if that’s your company’s style. It’s possible to appear professional while writing casually and enthusiastically about who you are. After all, you do it in conversation all the time, right? Of course you’ll want to make your “About page voice” consistent with the tone on the rest of your site. As a genre, the About page is a little more conversational in tone; but you don’t want to surprise your customers or prospects with a page that sounds nothing like your emails, your press releases, or the content on the other pages of your website. If you’re selling a CMS to seasoned web developers, you’re not going to talk to them like you’d talk to the guy sitting next to you on the airplane who’s just asked what you do. Those developers will certainly feel like you’re talking down to them. On the other hand, if you’re selling a CMS to business owners who have never written a single line of code, you’re only going to alienate them by talking to them like you’d talk to the developers. So unless your About Us page is addressed to people in your industry, avoid the tech- and corporate-speak. It’s boring, it’s cold, and it’s not memorable. You’re aiming for a combination of accessible and unforgettable, no matter your demographic. There’s nothing alienating here. Phrasee says what they do in plain English, skipping the mathematical babble they use to describe themselves elsewhere on the internet. You can use your jargon elsewhere, for sure. But if your About page is directed at people who are looking for your support and who are not in your industry, cut it. Otherwise, prospects are going to click out of your website and look for a company who can explain what they do in terms they understand. Pro Tip: If you’re having difficulty coming up with the right language for what you do, mine your emails, chat logs, customer product reviews, and customer service calls for the kinds of language your customers use when they describe your product or service. Your support team should be a great resource for this, too. Let your customers describe what your product is, and does, for your prospects. It’s not just the jargon you need to cut; it’s also the fluff. This means cutting out words that don’t actually say anything (“visionary,” “cutting-edge,” “world-class”), as well as any superlatives—unless you really have been voted “best,” or are the “only” one of your kind. A single exaggeration may cause a prospect to call into question the integrity of your entire company. If you’re really as remarkable as you say you are, you should be able to give your prospects the facts. Tell them about your products and let them decide if they’re “cutting-edge.” Provide the data and let them decide if you can really help “grow their business” or “increase their industry value,” or whether you have “excellent customer service.” The facts should speak for themselves. Your readers can provide the hyperbolic adjectives if they so choose. Don’t wax poetic, or ramble, to make your company appear more established than it is. 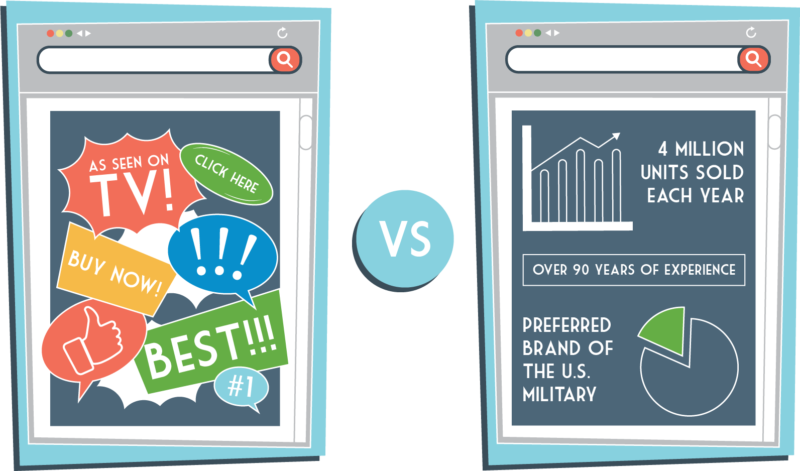 Your visitors will see right through the fluff-without-facts and click out of your site. If you’re a startup—or if you’re bootstrapping—own it and embrace it. Startups and bootstrapping are both great. Focus on how your prospects will benefit from the fact that you’re new, or small, or self-funded. Maybe this means you can pay more attention to detail or to individual customers. Maybe this means your orders can be smaller and your lead times can be shorter. And so on. In other words, quantify the benefits. Ditch the hype and demonstrate explicitly how you’ve provided solutions for others. Saying that you provide “excellent customer service” means nothing to your prospects (doesn’t everyone “provide” that? ); but saying that you’ve had 99.94% on-time shipping with an error rate of only .004% for the past ten years? That looks real good. If you don’t have facts and figures yet, describe what you hope to achieve, how you plan to achieve it, and what values are prompting you to take on your particular industry in this moment. Authenticity and candor are compelling. Your visitors will appreciate your honesty—and even your vulnerability—and they’ll be grateful to be given the chance to decide if they want to jump on board and be a part of your growth and your story. People want straight talk about your business. They want you to tell them, as simply and unambiguously as possible, what you’ve done for other customers. Why is this? Because what you’ve done for other customers indicates what you can do for them. Here’s a truth that may be more or less obvious to you: There will never be a group of people exactly like the group of people you work with. And when a prospect clicks into your About Us page, they’re curious about what your particular team is made up of. They want to know the real humans behind your business. Despite every company’s unique behind-the-scenes quirks, the vast majority of About Us pages are still stiff and boring company resumes. Surprise your visitor by offering the real behind-the-scenes tone of your company. People like authenticity. What’s more, the Advertising Research Foundation has concluded that “likeability” is the number-one factor in whether an advertisement will increase sales. This goes for About pages, too. OnWired is a web design agency. And while it takes them a couple of paragraphs to actually say this, they certainly break the mold with an unforgettable writing style, indicative of the personalities behind the screen. 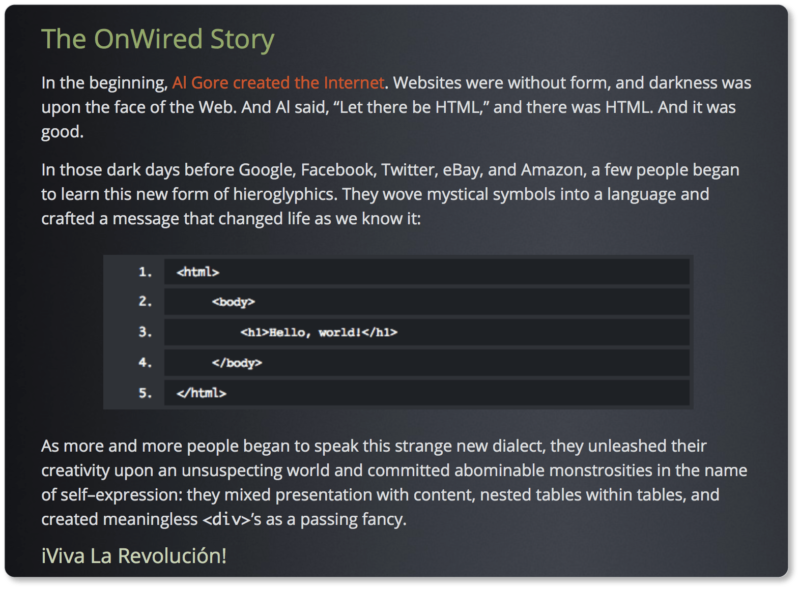 Their prospects get an idea of what it’s probably like to work with them: OnWired is willing to step beyond the expectations of what an About page traditionally “looks like” and take risks… which means they’re likely to do the same with their clients’ websites. Nothing showy or fancy here. Just a few plain-spoken sentences that suggest what Centaur Guitar values (“community”) and what their personality is (“different”). Even if your business’s profile isn’t particularly eccentric, this doesn’t mean your individual employees aren’t. Don’t hide the personalities of your employees; they are, after all, what makes your business tick. Drop the “B2B” (business to business) think and take on a “P2P” (people to people) mindset. The language and tone you choose to take on your About page will, of course, be determined by the kinds of prospects you hope to draw in. So consider your ideal prospect—the person you’d most want to see walk through your door in the pre-internet age—and reflect upon how you’d approach and speak to them. Would your greeting be formal? Funny? Enthusiastic? Sincere, or a little wry? If it helps, consider the conversations you have with your most loyal, most intimate clients. Describe the tone of those conversations, and write your About page in that tone. Finally, read the copy of your About page aloud once you’ve drafted it. Read it to yourself, and then read it to an audience (even if that audience is an audience of one… and even if it happens to be your dog). Read it three, five, ten times out loud. If you find yourself stuttering over the same word every time, it may be a word that’s got to go. If you find yourself feeling self-conscious about a particular sentence in front of your audience, that may be a sentence worth reconsidering. “Performing” your About page in this way will ensure that it reads as smoothly as an actual conversation. And it’ll make it a page all the more likely to draw your reader in through its authenticity. In the next section, we offer strategies for humanizing your company through the story your About page tells. Your story, after all, is what makes you unique in your industry. These strategies include describing your company values, introducing your team, and communicating the “why” (rather than the “what”) behind your product or service.